And so we come to the last round of games of the Australian season, with a couple of games to report on, and a roundup of the biggest runs scorers and wicket takers. Aditya Adey’s Bathurst drew their Semi final last week, with St Pat’s Old Boys finishing on 307-8 in the 114 overs played over the weekend. And in the other game, Diarmuid Burke’s Scarborough U15s lost their Grand Final, with Gosnells chasing down their 146 target in 46 overs for a 7 wicket victory, Diarmuid’s figures 0-6 over his 5 overs, the most economical of their 9 (nine!) bowlers given the ball. 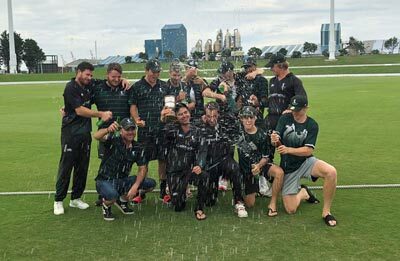 In New Zealand, At The Bay Oval The Cadets won the Williams Cup by six wickets with Northern Districts batsman Joe Carter finishing 80no. Unfortunately neither Jonathan Waite and James Metcalfe were in the starting XI, with Jonathan acting as 12th man. It was still a fine way to finish off what has been a fantastic learning experience both on and off the field. Jonathan and James are extremely grateful to the staff and pupils of Tauranga Boys High School for giving them the opportunity to spend almost eight months working in the school, and to the players & members of The Cadets cricket club for giving them the opportunity to play and develop their cricket. The next time they are on the cricket field together - The first NCU Premiership game of the season - Instonians v Lisburn at Shaws Bridge! A stump mic might provide for some interesting chat! Overall, 33 Ireland-qualified players (that we’re aware of) played club cricket in Australia this season, about half of whom have played Inter-Pro or Super 3 cricket. The grades they played at varied a lot, and so it is hard to compare one average with another, but it has to be said that most of them will be happy enough with how they performed, in very different conditions to a drizzly afternoon in Coleraine. Some will be delighted, and will face 2019 with a lot of well-earned confidence. Sean Terry showed a glimpse of what we are missing with his retirement from professional cricket, being called up to the Big Bash, and while Nick Larkin may be a lost cause, who knows with Terry, perhaps he may re-visit that decision in 2019, with the World T20 World Cup qualifiers looming. Of the others, Eoghan Delany, who returns to Clontarf this Summer, signalled he’s in contention for Lightning selection again, and Graham Kennedy reiterated his all-rounder credentials. Certainly among the bowlers, Ross Allen’s 38 wickets at 6.76 really stands out (he also made 233 runs at 21.18), and it’s not surprise, therefore, to hear that he was voted Latrobe Valley & District Cricket League (LV&DCL) Grade A Representative Player of the Year, and was selected in the LV&DCL Grade A Team of the Year. He may be the player to watch in this season’s inter-pros, and if he does well there, selectors will have their eye on a good all-rounder with an ability to accumulate runs when batting. Nathan Smith showed what we are missing out on as a result of his moving on, but there were also good records for Kevin Prior and Jack Carty, two young players hoping to make their mark in the LCU this year. Aaron Gillespie also proved his all-round credentials, and you can see from these stats what the Ireland Wolves selectors see in him. After a difficult 2018, and a slow start to this season, Jacob Mulder’s performances improved, and with T20 high up the agenda this year, one hopes this can be his springboard back into contention in 2019. Overall, my impression is that there were a number of players who were outstanding in the leagues they played, and who, if returning next year, could consider playing at a higher level, perhaps with the big Sydney clubs if they can get placed. But whatever level they play at, it seems all players benefit from these stints. Talking to families of younger players, I’m also taken with how they talk about it as a learning experience for these players, in a much wider sense than sport. At the end of the day, cricket is just a sport, and if these young men and women learn more about themselves from these adventures, it will, hopefully, benefit them the rest of their lives. So that’s the last installment. Many thanks for all the information passed on over the months, and here’s hoping for a great season of cricket in our own hemisphere!